Join the discussion on our forums! Come discuss Holomancer over in our dedicated Holomancer discussion topic. The only application I can see is a kinda counter for deathrattle rogue with remaining one durability on Necrium Blade - it prevents him from carelessly playing the deathrattle egg/dragon/whatever deathrattle minion that he wants to trigger. But boy, is that convoulted. I do my quests every day and buy decks solely with earned ingame gold. This card and Flark's Boom-Zooka are Blizzard’s punishment. Oh, and the Star Aligner - another useless b11. If it was a 5/5, it might be okay. Still wouldn't see play outside of Arena, but whatever. Its stats are complete trash, its effect is going to have marginal impact if it triggers at all, and is completely opponent-controlled, so you can't even synergize with it. It's completely useless in Arena, and might be even worse (yes, actively harmful) in Constructed, because of Doomsayer. Oh, and it doesn't fit into any archetype: not aggro, nor midrange, nor control, nor combo. Rating this "Dust it!" is generous. 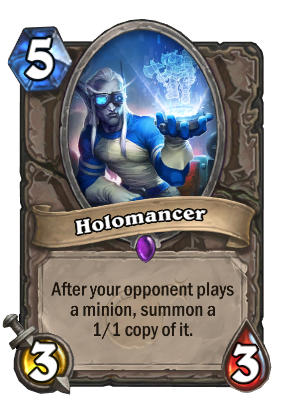 So it's a 5 mana 3/3 do nothing that your opponent knows about and can kill before playing anything? At least give it stealth or can't be targeted so it might actually be a little useful. I feel bad for the people who made the golden animation, it's never gonna be seen ingame. Who on earth votes for Bad and higher? This is epic card that will never see a play. Nor in fan-game, nor in arena, nor in constracted. Mayby in the very-very specific brawl or pve. That's it. This card is understated, and its effect works in your opponents turn ONLY. And EVEN, even if your opponent doesn't kill it, you'll just get 1/1, that's useless. Jesus Christ. 100 dust is more usefull. I don't understand why its stats is so crap tbh. It reminds me of Mini-Mage. maybe as tec vs druid? Dollmaster Dorian is basically this but has more of a chance to live. It still fails to survive every time. Because of that, this probably isn't any good. I completely agree with you, that's why Holomancer I just got will be sent to the same Minions Chipper I sent Dollmaster Dorian yesterday. Holomancer + Master of Disguise! Pay 9 mana to inhibit (maybe?) your opponents from playing their most valuable minions for 1 turn! What a combo! In all seriousness though, this is mostly a bad card due to its terrible stats. With only 3 health and without stealth it will be removed way too easily. So it's mostly just a bait for removal spells (if it's protected by your other minions). Not worth opening a slot in the deck just for that.